En-route back to Cape Town from Hermanus, I could not give up the chance to pop in at Flagstone Wines when passing through Somerset West. I mean, you all know that I do enjoy my Flagstone Wines. 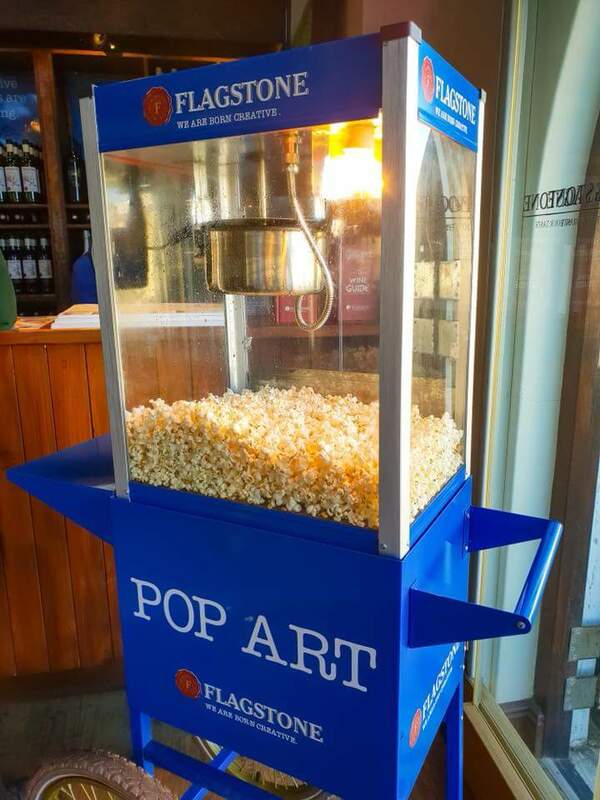 But also, when I popped in there, little did I know that they have a new & unique tasting experience, that will leave you popping with excitement. 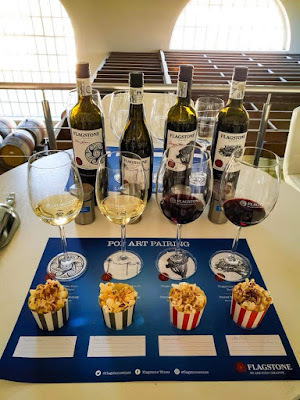 The PopArt wine pairing at Flagstone includes tasting 4 of their wines & pairing them with popcorn. Definitely not something that you have heard of before right? 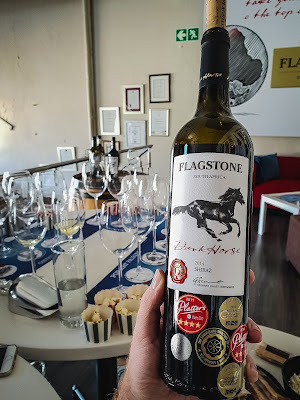 Well see, that's also why I love Flagstone Wines. They are consistently thinking out of the box to come up with new & fresh ideas to keep up with changing markets, but also to be different & not do the conventional pairing options that you find at so many other wineries. - Free Run Sauvignon Blanc, paired with Cinnamon & Sea Salt popcorn. 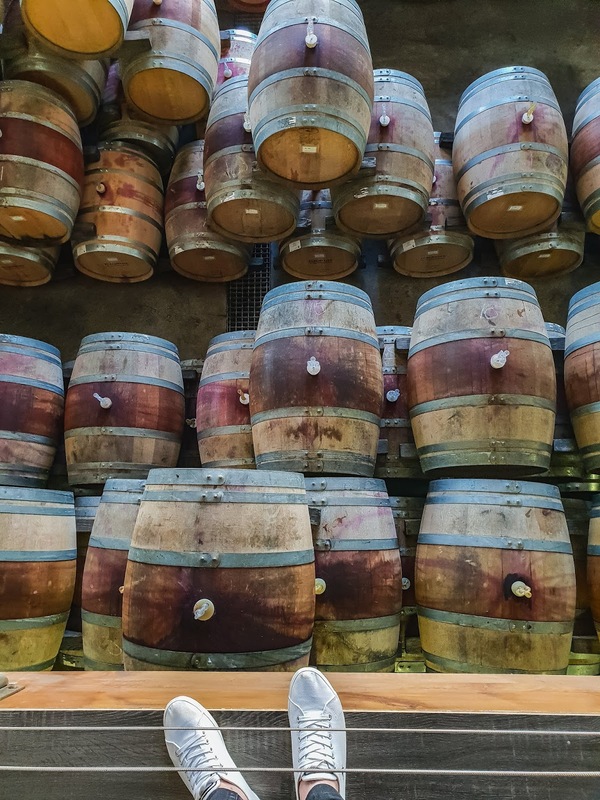 The Free Run is a nice fresh & crisp sauvignon blanc that is a gorgeous pale straw colour, with a hint or 2 of a lime green when held up to the light. On the nose, surprisingly intense but those green peppers & lime come through strong & steady for me. Every now & then I get a bit of passion fruit too. The nose follows through to the palate, a nice crisp mouth feel with a very nice balance and lingering taste. 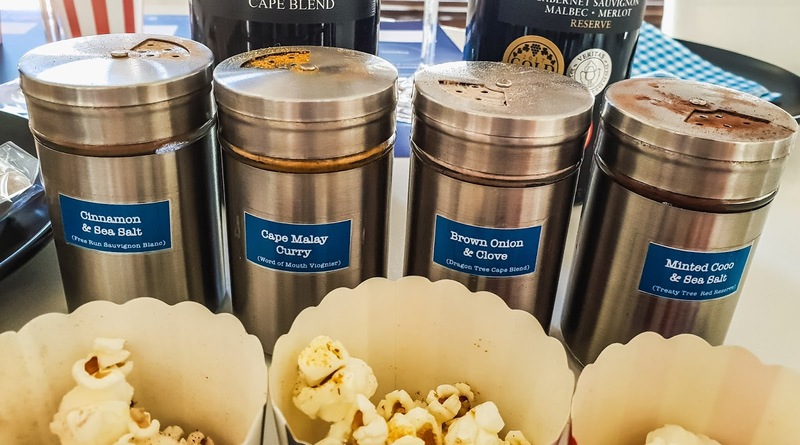 - Word of Mouth Voignier, paired with Cape Malay Curry popcorn. A glass of wine that is gold in colour & gives you white peaches & summer fruits on the nose, which all come through on the palate, but then there is a touch of spiciness. Nice easy drinking, yet complex, medium bodied wine with a fresh acidity & works incredibly well with the Cape Malay Curry spice. I can't wait to try this wine out at home with a proper curry. - Dragon Tree Cape Blend, paired with Brown Onion & Clove popcorn. A rich ruby red colour fills the glass & sure will give you a whole lot of complex notes on the nose. But lets break it down. Ripe dark red & purple sweet & spicy fruits coming through strong. Then don't be surprised when you smell a bit of mint too. In the mouth, a soft yet crisp & fresh wine with a mouth full of those fruits that linger just right afterwards. - Treaty Tree Red Reserve, paired with Minted Coco & Sea Salt popcorn. Another deep ruby red glass, but on the nose you get ripe strawberries & cherries. 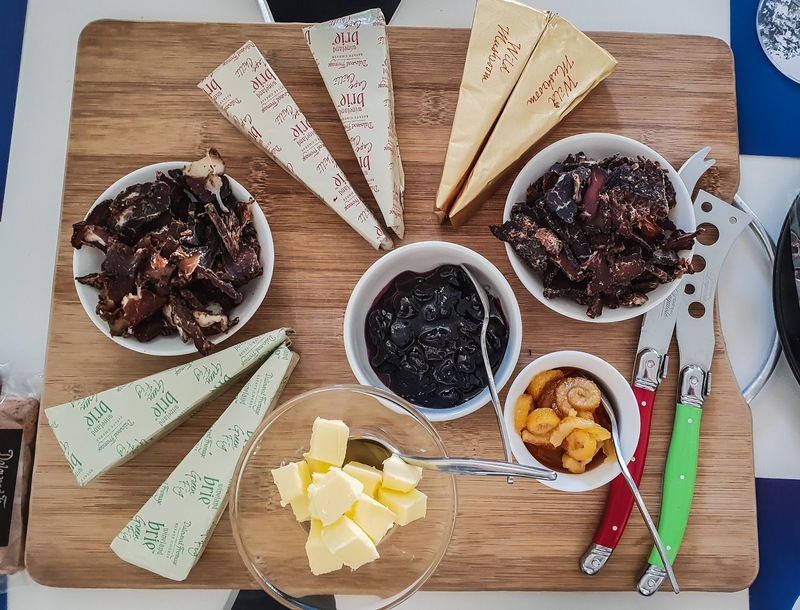 A creamy finish on the palate finishes of the bordeaux blend very well with flavours of mint & ripe red fruits. The minted coco & sea salt worked so well with the wine, enhancing those mint aspects that came through, as well as the sea salt bringing out the flavours of the red berries. Dark, rich, ripe plum colour. With blackcurrants & black fruits filling your nose with a slight bit of spicy undertones. A bit of a complex wine on the nose & the palate, as it is a full bodied red that is smooth & silky yet it has so much character. Then those black fruits & dark chocolate linger on the plate as you savour your sip. Check out Flagstone Wines here. 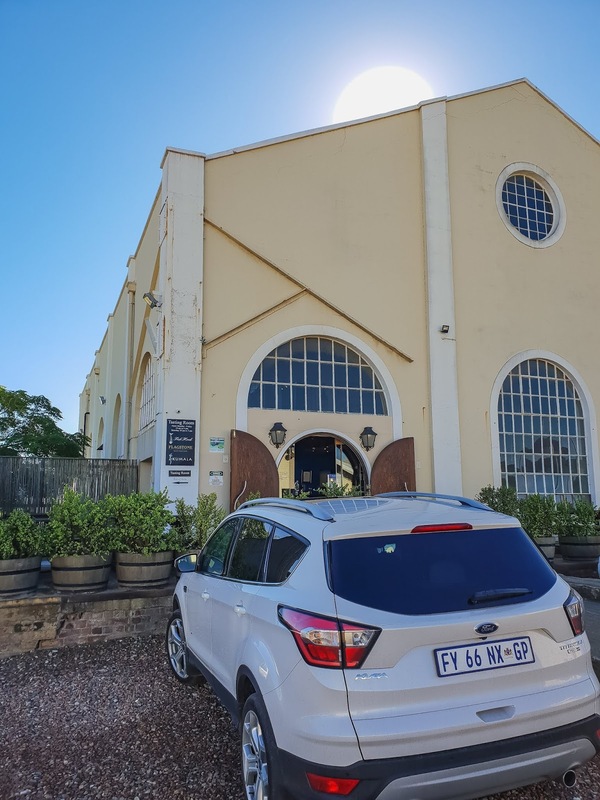 #WineRoutingWithLloyd was driven by Ford, in the all new Ford Kuga.